While it might seem like a universal truth that all dogs are ‘good boys’, even the sweetest of pups need to be taught some basic discipline to have them around the house safely. Be it hyperactivity or possessiveness, training is a must so your puppy knows its limits, and does not wind up hurting itself or someone else, causing unnecessary disruption or damaging any of your valuables. And when you’re training two dogs at once, it can be double the trouble. This is where training collars come in. 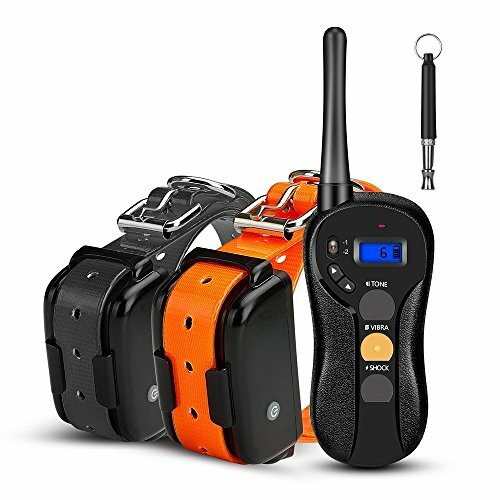 Not to be confused with ‘shock collars’, controversial due to the enduring question of how humane they are, these collars come with varying degrees of disciplinary modes to help you reinforce correctional behaviour into your pets, using just one handy controller. Let’s take a look at our top picks for the best training collars out there for two dogs. 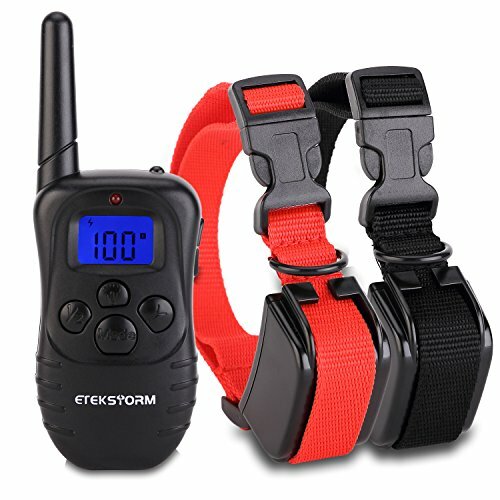 Effective over 660 yards and with a single receiver capable of connecting to two receivers, these training collars are made of non-irritating silicone which can sit comfortably and snugly around the necks of your pets. Fitted with perfectly safe contact points to transmit the signal you choose, these collars come with an in-built shut-off system, which times out any stimulation after ten seconds to avoid accidentally hurting or overstimulating your pets. The collars come with three control modes: tone (a warning noise), vibrate, and shock. The shock option is similar to the harmless sensation of a static shock, which won’t hurt your puppies, but will be unpleasant enough to get their attention and convey your disapproval when they’re misbehaving. The collars also come with 16 varying degrees of intensity, so it’s recommended to start at the lowest intensity and work your way up depending on whether you’ve managed to get your dogs’ attention, without risking hurting or scaring them. Also waterproof, the receiver has two sets of options to let you individually control both collars, and comes with rechargeable batteries, so you don’t have to worry about them running out. Rechargeable and water-resistant in light rain, these collars have a transmission range of 330 yards, with an LCD backlight to ensure visibility both during the day and at night. With an adjustable nylon material to snugly fit around your pet’s neck without causing discomfort, the collars come with three modes: beep, vibration and shock, with adjustable ranges of intensity (from 1-100). It’s recommended you start off slow, with either the ‘beep’ or ‘vibrate’ options on low, and test which level of stimulation is enough to get your dogs’ attention. Only use the ‘shock’ option – also on low, as users have cited 15-20 is generally effective – if your dogs continue to misbehave. The remote allows you to switch between dog collars to let you control each individually. The contact points of the collar are made of surgical stainless steel, embedded into a silicone strap, both designed to provide optimum comfort to your dogs and not irritate them when worn. 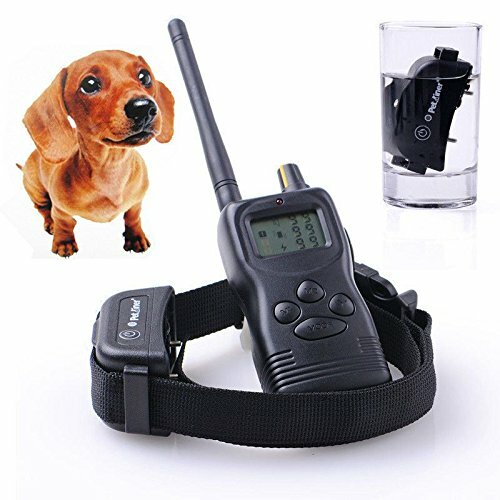 Over a transmission range of 450 yards, you can use the ‘beep’ mode as a warning noise to discipline your dog, or choose from 16 levels of vibration or shock, though we highly recommend starting with the lowest possible settings first and only using the ‘shock’ option if your dogs are refusing to cooperate. To ensure your dogs’ safety, the remote comes with a built-in time-out system which shuts off the stimulation after 10 seconds. Moreover, it’s specifically designed with varying textures and shapes to let you distinguish the buttons without having to look away from your pets, so you can completely devote your attention to training your dogs without fiddling with the remote. The receivers are also built to be 100% waterproof, safe for use in the rain or if you decide to take your dog for a swim. With four training modes and a range of 1-100 for both the ‘vibrate’ and ‘shock’ options, these collars are designed in particular to be totally safe for smaller dogs, though they are perfectly safe and effective for dogs of all breeds and sizes. 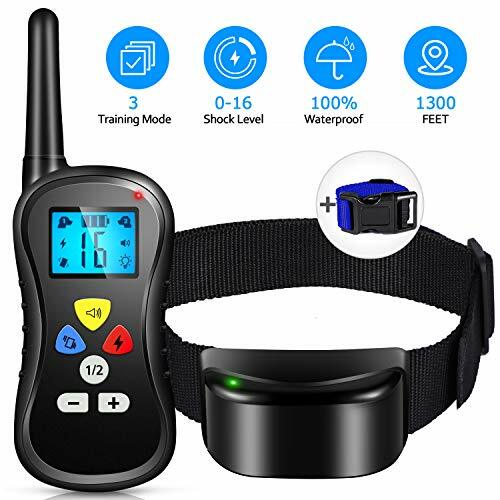 Equipped with rechargeable lithium batteries and effective over a range of 330 yards, the collars come with a built-in light for better visibility in the evenings, fitted with three metal probes which maintain contact with your dogs’ skin without hurting them. The transmitter can alternate between sending stimulation to either of the two collars. Training your dogs is all about a pattern of reinforcement – positive reinforcement or treats for good behaviour, like listening to instructions, and negative reinforcement for bad behaviour like incessant barking at strangers. Training collars are great tools to use for negative reinforcement. Getting your dogs to associate certain behaviours with a negative outcome, such as the unpleasant sensation of their collar vibrating, or the startling noise of a warning beep, conditions them to avoid those behaviours. The important thing in choosing the appropriate collar, though, is making sure it won’t hurt your dogs. The best training collars come with varying modes and intensities of stimulation – you can choose to startle your dog with a beep or the feel of the collar vibrating long enough to get their attention. If there is a ‘shock’ option, it’s extremely important to start out at the lowest setting, trying out the kick of the stimulation yourself first so you don’t wind up hurting your dog. The appropriate sensation is that of a mild static shock – unpleasant, but not harmful. Transmitters which automatically shut down the stimulation after a few seconds are also recommended, so you don’t accidentally hurt or traumatise your dog. Collars also need to be adjustable so as to sit properly around your dogs’ necks without sliding around – this can irritate the skin and cause discomfort, and not deliver the stimulation as intended. If you have a pair of dogs, it makes more sense to choose an option which accommodates two collars with one transmitter, rather than two separate collars and sets of remotes. A remote that transmits over a reasonable range and lets you easily alternate between collars is ideal. How you use the collars is also important. Rather than using the remote every time your dog misbehaves, it’s more effective to try and get your dogs to listen to your instructions, using a noise or the ‘vibrate’ option to get their attention, and the ‘shock’ option when they are absolutely not cooperating. Timing is also important – your dogs need to associate the discomfort they feel with the behaviour you are trying to discourage, so don’t use the collars after they’ve behaved badly. These collars are meant to discipline, not punish.